The Garmin Vivosport is a fitness band with the fitness credibility of a larger runner’s watch. It has GPS, it has a heart rate sensor, it even has an altimeter and shares an app with the Garmin Forerunner 935. That's a lot of top-end technology that's being crammed into fitness band - but be warned. This may sound impressive, but Garmin has actually made a device just like this before. The Vivosport is very similar to the Garmin Vivosmart HR+. So similar we had to be extra careful to dig out the differences to make sure it’s the new model we should recommend. So what's actually different here? Well, you get more battery, a slimmer band, a design that's touch-focused and more high-end features like VO2 Max reading and stress testing. But does that make the Vivosport a worthy upgrade? The Garmin Vivosport is out now and initially it may seem expensive. It retailed at launch for around £160/$160/AU$300 online, which is a high price for a device that looks like a normal fitness band. It's not one, of course. If a step tracker is all you need, you might as well save your money and get a Vivosmart 3 instead. The Vivosport’s real rivals are bands like the Fitbit Surge and Samsung Gear Fit 2 Pro. If you saw all three on one wrist, the Garmin's initial appeal would be obvious: it's small and unobtrusive for a tracker with its features. We’ve used a handful of Garmin fitness bands that look a lot like the Garmin Vivosport over the last couple of years. This shows the blueprint works, but also makes you realize how weak a visual identity these bands have compared to some of Fitbit’s. 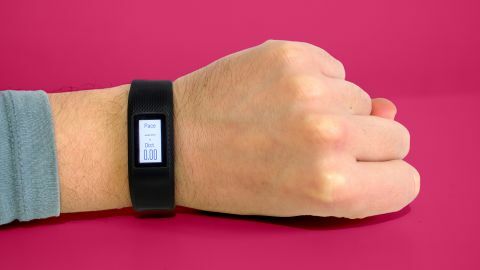 The Vivosport is a dark grey rubbery band, in which a small rectangle of screen sits, bordered by a strip of black. Unlike Samsung’s techy fitness bands, the screen doesn’t dominate the front. And to our eyes, the Fitbit Alta looks more stylish. Garmin didn’t make the Vivosport as a fashion statement. We hope it didn’t: this isn’t one. However, there have been some positive changes since the Vivosport’s predecessor, the Vivosmart HR+. The band is now a little slimmer, and the button below the screen has gone. Best of all, the Vivosport display is color. The Vivosmart HR+’s is monochrome. A device like this, which doesn’t have apps as such, only has so many uses for color, but it certainly makes watch faces look more interesting, and injects a little much-needed fun. The display is of the kind Garmin uses for just about all of its fitness devices. This is a 72 x 144 transflective memory-in-pixel screen. Beyond the imposing name, it has a few important characteristics. Our favorite, just displaying an image barely uses any power, letting the Vivosport display stay “on” 24/7 without killing the battery. It also feeds off ambient light, only getting clearer as the sun gets brighter. In a dark room, the Vivosport looks invisible until you activate the front light with a wrist flick or screen tap. This light is more powerful than in previous Vivo bands, but also has a blue tone that skews the screen distinctly. Next to the Samsung Gear Fit 2 the display is not all that pretty, but it certainly is immensely practical. Wear the Vivosport without starting any “activities” and it’ll play the part of basic fitness tracker very well. It’ll log your steps, your sleep and the number of stairs you climb without fuss. It can also auto-log runs and longer walks (10 minutes and over) as separate entries in the companion app. However, the upgrade to the Vivosport is all about the activity menu you get to by long-pressing on the clock face. This takes you to the series of different sports the band supports. The most important are cycling, running and walking/hiking. There are also gym modes, but the only one that records interesting data beyond your heart rate is the rep counter, for the weight lifters and star jumpers out there. There’s one glaring omission, swimming. While the band is water resistant to 50m, there are no modes to count your lengths. We tried the Vivosport in a local swimming pool using one of the general indoor exercise tracking modes. It had a pretty ropey go at recording heart rate figures under water, but that’s all you get. Performance is much better if you stick with its fortes, running and walking/hiking. You’ll get fully mapped routes of your runs that are, for the most part, very accurate. We tested the Vivosport during several outdoor walks and jogs, and the only time the resulting map was wrong was when we forgot to stop the activity after returning home. It then appeared as though an angry toddler had filled in the area around our flat with crayon, likely the result of the Vivosport desperately trying to needlessly fill in the route as it begged for scraps of GPS signal indoors. Speaking of GPS, it's generally very good. But on first starting with the band, it seemed the Vivosport’s GPS was a little problematic, due to lock-on speed rather than accuracy. The first triangulation took almost five minutes, which is unusually lengthy. The second then took just under a minute: too long for a second stab. However, since then the Vivosport seems to have bedded in to its home, rarely taking more than a few seconds to triangulate position. The Vivosport’s heart rate sensor uses Garmin’s Elevate hardware, which takes readings every second when monitoring heart rate (this is very frequent, if that’s not obvious). This has since been augmented by abnormal heart rate readings, where you'll be alerted if you go over a certain threshold at rest. This is set to 100 bpm by default, but if you're know you're a little 'beaty' you can alter this. On the treadmill the sensor’s results seem fairly good, if a few beats per minute higher than the readings of the electrical sensors of a high-end treadmill much of the time. It responded reasonably well to interval training, noting the drop in heart rate fairly well, and picking up the subsequent increase in heart rate almost immediately. This isn’t a chest strap-beater, but it will do the job. And the Vivosport is much better at 24/7 resting rate tracking than most slim fitness bands.